Fair fashion, ethical fashion, sustainable fashion, fashion for good - all these phrases express the overall responsible style and purchases we can make as consumers in this specific side of the fashion industry. 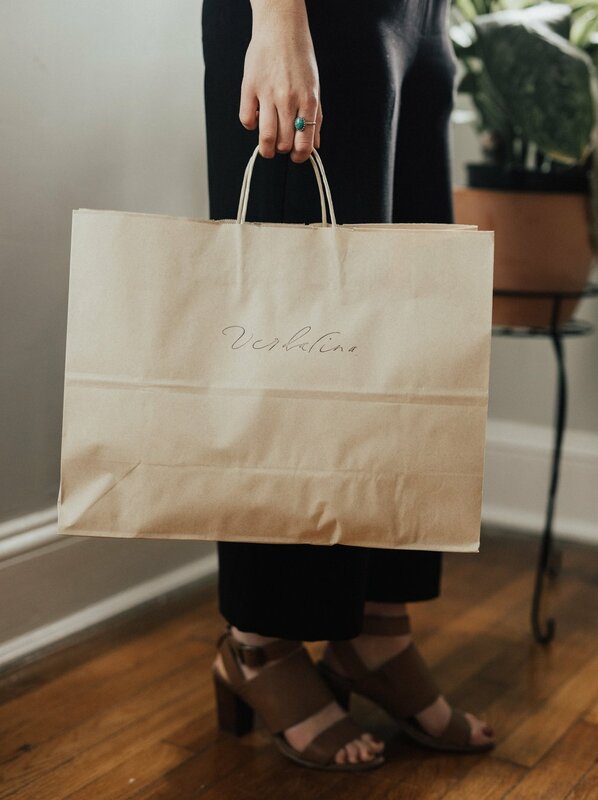 These define companies that are focused on global fair wages, responsibly sourced materials, safe factory conditions, transparent conversations and responsible recycling + waste management of our clothing from individuals (our closets) and brands (what doesn't get sold). But if you're not familiar with shopping ethical fashion, it can appear complicated, inconvenient, and/or expensive. I'm not going to lie, it can be a lot more information to think about than just stopping by at the mall! Today's fashion industry is all about convenience and it's sometimes inconvenient to think more about the background of our clothes. But similar to the food industry - with the more information that is revealed, the more we should pay attention. Because the reality is... our purchases make impacts. With a background in the fashion industry (you can read more about that here), a few years following ethical fashion brands and now over half a year strictly shopping fair fashion, I've come up with a few ways to make it easier and more convenient to shop fair. Below are 5 tips, that I use, to shop ethically + sustainably! The first tip in shopping fair fashion is deciding what item (or items) you really need. Whether it's a sweater or a new piece of jewelry, this initial step will help you decide what brands to look and research for. This will also help plan a more full closet that can be worn for a variety of occasions while avoiding impulse buys from larger, less transparent companies. The second important tip is to decide on your price range... Once you know what style piece you're looking for, it's important to realistically determine the price you'll be able to spend. Often times, we can't just spend $120-300 out of pocket, but have to think through and budget our purchases. A big theory behind fair fashion, capsule wardrobes and minimalist closets is that you are investing in the items you wear. Just like anything you purchase that you'd like to last long term (think electronics, home decor, etc), you want your clothing to last too! Which means that for majority of us, we must save to be able to spend. Setting a new mindset on what to expect when you shop will be very important when researching ethical brands and items to buy ; Rather than making purchases that are from the impulse of convenience or just because they are cute and cheap. I've been in situations where I'll run to a store in need of an item and am tempted to purchase something cheaper that won't last more than a year. Shopping ethical fashion is just a new mindset. This step will help you value your wallet and clothing a bit more while purchasing a garment that will last for years to come. While purchasing, it's also important to pay attention to what you typically wear or what silhouettes you're comfortable in to make the decisions on shopping online brands. You don't always need to go with the trends - stick with what you love! * Extra tip : When shopping take an extra 5 minutes to ask yourself... Do I really need this? How many times will I actually wear this? Can this be paired with more than 3 things in my closet? Do I need this more than another item? When researching fair fashion brands + avoiding impulse buys - you can use the resources that are already out there to help make shopping easier! Researching can take time, but there are dozens of influencers and companies that can help make the process simple and efficient. Many blogs and Instagram accounts are focused on providing resources and facts for you (other than The Good Wear course), as well as books, online resources, podcasts and more. If you like shopping online, download the Google Chrome extension, DoneGood. This simple tool will keep you informed if you're on a site that is "DoneGood approved" - meaning they are ethical brands. And if they're not proven (yet), DoneGood will recommend other places to check out for similar styles. *I use this in my browser and love it - makes shopping very convenient online AND sometimes provides discount codes. Use the site, Project Just, to find out information about a few of your favorite brands including companies like Madewell, Anthropologie, Jcrew, etc. This helps you weigh what the brand is doing well and what they need to approve on to run more ethically and sustainably. *disclaimer : this site allows you 3-5 views of companies per month before having to subscribe to the monthly service! So use wisely before subscribing! Listen to the podcast, Conscious Chatter, to hear details from real fair fashion brands, influencers and facts about the industry. The last tip surrounds social media. For me, this has been the biggest tool to help find new fair fashion brands that hold the values The Good Wear believes in. Following brand and influencer accounts will help you stay in-the-know about industry details, new brands, sales, products, and more. And there are so many existing globally, USA made, artisan made, or manufacturing companies that you can connect to! These are real people, doing awesome things for the world! Check out a few Instagram lists here and here. Need more recommendations? Leave a comment below. Do I need a few more weeks to save for the item I want? We are often impulse buyers and this can be a hard rule to follow. But to take a bit more time to think about the item, style and brand that you want to buy can help justify a purchase and make you more conscious of your wallet + closet. Do I already own this similar item? If so, going back to tip 1 could help narrow down what is needed for your wardrobe. This check and balance will save you money in the long run! For example, I have several black dresses and probably don't need another at this time, regardless of the brand or look! If I need something more immediately, can I thrift for it? This is also another helpful stopping point - if you can't afford the expense at the moment and need something quickly (whether for an event or work), it might be a better option to thrift or check out a vintage store for timeless styles rather than purchasing cheaper clothing. *for more ethical fashion advice, check out the following Good Wear posts.